Waking up at Redding: Since the family was tired from previous day roundtrip to Crater Lake, everyone woke up late around 8:30 in the morning. By the time we got ready, it was 10:10, and we missed the complimentary sumptuous Best Western breakfast buffet that closes at 10:00. But, we couldn't miss breakfast altogether, so we first headed to Denny's and paid $30 - so much for a 10 minute slip! We got on 5N, and after a 10 mile drive we got to to the visitor center. While I knew I could cover the Shasta Dam and Shasta Caverns the same day, I was just curious if I could also go to the McArthur-Burney Falls. The ranger told me it was about 70 miles east on highway 299 east, and that basically meant it would have to be another day, another time. Shasta Caverns: So, I got back on 5N, and got out the on exit 695, which was the Shasta Caverns exit. The road winds a bit and ends up at the ticketing center where the tour starts. The ticket was $20 per adult and $12 for children. The first part was a ferry boat ride to get across the lak e to another point. A series of winding steps down, and a short muddy trail leads to the boat. We carefully made it down, and waited for the next boat to take us in. The boats leave every half hour. 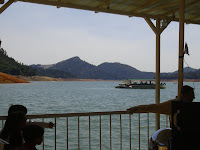 Once we crossed over the lake to the other point, there was a bus waiting to take us to the caverns. It's a short 10 minute ride uphill, but the road is narrow and steep on the side, which makes it a bit scary. The bus driver said, "This is my first day on the job", adding to the anxiety and humor! When he asked where we were from, there was a large group that answered "Iran", and his response was "Welcome to America"! It was very funny - if you are wondering why, read up on current political situation between the US and Iran. The bus got us to a cabin, which is at the entrance to the cavern. 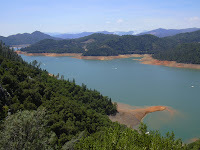 Because of the elevation, you get some pretty good views of Lake Shasta from the bus and this cabin. A small door opens up a dim lit tunnel, and this leads up to the cavern.This tunnel was apparently dug much later than when the caverns were discovered in 1850s - the original discoverers had to crawl through openings to get inside. There is a huge stair case with close to 100 steps, and we had to climb at least 20 of them to get to the various chambers within the cavern. 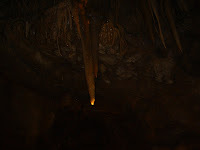 Inside, you get to see the exotic natural limestone formations (stalactites and stalagmites). We saw a couple of chambers and then came back to the cabin, as we were slow with 4-year olds and no way they or my dad could have managed 80 more steps. Once the group completed the tour, we headed back by bus and the boat ride. Climbing back to the ticketing center would have been a challenge, but we didn't have to do it since they had a bus that could take some of us up. That concluded our Shasta caverns part of our trip, which took a total of 2 hours from the time we left Denny's. 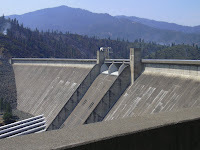 Shasta Dam: Tracing our way back from Shasta caverns road, we got on to highway 5, heading south toward Redding. 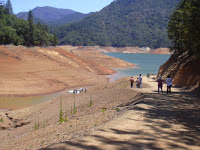 The Shasta Dam road or highway 151 is on exit 685. 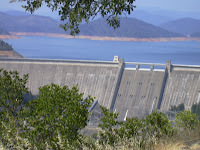 After about 7 miles west, we could see the dam and the parking lot. We parked, took a peek inside the visitor center that had all the history, statistics and such good stuff. What caught my eye was the comparison with Taj Mahal and Statue of Liberty - the dam was 3 times taller at about 640 feet. Since we were a little late to the official tours that walk us inside, and explains how all of this works (the last one leaves at 3:30 pm), we had to settle for outside views. From the site, we could see several forest fires (actually the smoke from the fires). We took some pictures and headed back to the car around 4pm. Drive back home: We grabbed a bite at a Taco Bell in Redding, and continued on 5S all the way to bypass 505 with one stop at a starbucks in Corning (I think). On highway 505, we noticed a guy scrambling to pick up stuff that had fallen from his car and scattered on the highway and putting them back into his trunk. It would have been sure death on most highways, but since this was a bit isolated, people could notice and slow down and he could manage the scramble. We continued to 80W, and then to 680S, and survived the strong winds on the stretch until Benicia bridge. Once we reached Walnut Creek, it was around 8:15 PM, and we decided to have dinner, or risk the children dozing off hungry. We spent some 20 minutes searching for an Indian restaurant, and finally found an one on Main street called Breads of India. Short menu that met our needs, but the food didn't excite the family. It was another forty minutes drive back home, and there was a nasty surprise waiting for us! The sprinklers were running in the backyard for we don't know how long! The auto shut-off had failed, though the darn thing turned on sometime one of the evenings! I think it only failed that evening, since it was only flooded so much, but we'll know when this month's water bill comes in!